It’s really hotting up now. We’ve got the electric fans on full whack here at UrbanMale HQ and hot drinks are a total no-go. I think it might officially almost be time to almost possibly say for certain that it’s nearly summer. As you’re peeling the jumpers and jeans which have been glued to you for the past months, you start thinking about what to wear at summer. Shorts, vests, thin t-shirts, espadrilles… and some new summer jewellery! We’ve just started stocking up on some sets of jewellery making it easier to buy your stuff. You won’t have to worry about searching through pages and pages of earrings you don’t like and pendants you won’t wear. Just have a look at the ‘Sets’ section of the website and you’ll find double pairs of earrings, pendants matched up with earrings and many more! 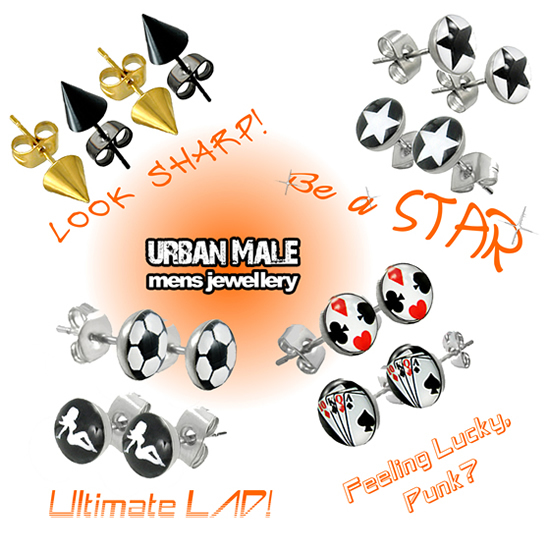 No longer will you have the strife of trawling through men’s jewellery trying to find matching pieces. We have pendants and earrings with star designs, the first of their kind on our website. Have a look below for a little snapshot of some of our favourites. So there you have it. Innovation at it’s best. Okay, so it’s no revolution, but hey! Didn’t we just make things easier for you?